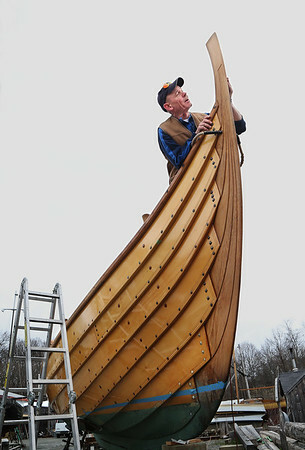 Stuart Boyd of Beverly examines the bow stem of the Polaris, a 37-foot reproduction of a traditional viking boat, on Friday at the Essex Shipbuilding Museum. Boyd commissioned the boat from a custom builder of Nordic boats in Anacortes, Washington. The design is modeled on a 1,000-year-old boat on display in Denmark.